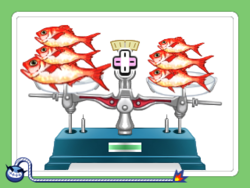 Tip the Scale is a microgame found in the IQ folder in WarioWare, Inc.: Mega Microgame$!. It reappears in WarioWare Gold, this time hosted by Mona. There will be a scale in front of the player. 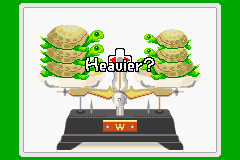 On it, turtles of varying weights are on each side. The player then has to decide which one is heavier. There are three types of turtles: small, medium, and large. If the player chose the correct pile of turtles, the room will become yellow. If not, the room goes gray. 1st level difficulty: There are three turtles on each side. 2nd level difficulty: Same amount of turtles, but the three sizes are mixed up. 3rd level difficulty: There are four turtles on each side and the three sizes are mixed up. The WarioWare Gold version features more items to weigh, including fish, cats and human-shaped turnips. The third level, however, always features stacks of pancakes, some of which are cut in half. This page was last edited on March 8, 2019, at 21:02.